PFC Gallegos began his career with the U.S. Marine Corps less than one year ago, right after he graduated from high school. Without any second thoughts, he began boot camp training at MCRD in San Diego, CA. After boot camp at MCRD and School of Infantry (SOI) training at Camp Pendleton, CA, PFC Gallegos was stationed in Pensacola, FL for aviation school. 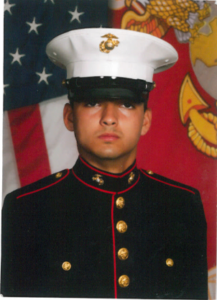 PFC Gallegos is currently stationed out of Marine Corps Air Station in New River, NC. He is scheduled to come back home to Chicago for the Fourth of July weekend and will be flying out to Quantico, VA to begin his training for Presidential Detail this October. Out of nearly 200,000 U.S. Marines in active duty, only 250 are selected for Presidential Detail and it is considered one of the great honors in the service. As one of the 250 Marines to be assigned to Presidential Detail, PFC Gallegos will now have the honor and duty of escorting the President of the United States wherever he goes, stateside. As part of this assignment, PFC Gallegos has been given the highest security clearance possible in the armed forces for a person of his rank. Over the next four years, PFC Gallegos will be under the command of current President Barack Obama as well as Obama’s successor. Jose Gallegos is extremely proud of his nephew’s achievement and cites his helicopter pilot’s license as the factor that set his application above the rest. We wish PFC Gallegos the best of luck in his future endeavors!